We invite you to join AF3IRM for our events for International Women’s Day and for the rest of Women’s Month! We are proud to be able to present the International Women’s Day March in Los Angeles for the third year in a row and to participate in the International Women’s Strike. We will also have a noise demo in solidarity with all immigrants in the San Francisco Bay Area. See our calendar below for more information. AF3IRM is the beneficiary for this year’s banquet. Guerrilla Action! Demand accountability for the state’s disregard for women’s lives – bring a purple dress on a hangar to symbolize a woman or community of women you want to recognize. Federal Building, 300 N. Los Angeles St.
AF3IRM NY will be speaking at the International Women’s Day rally led by the Socialist Party (locale of NY), March 8, 4-8PM, Washington Sq. Park. To those who cannot miss work, please wear purple, red or black to show solidarity. 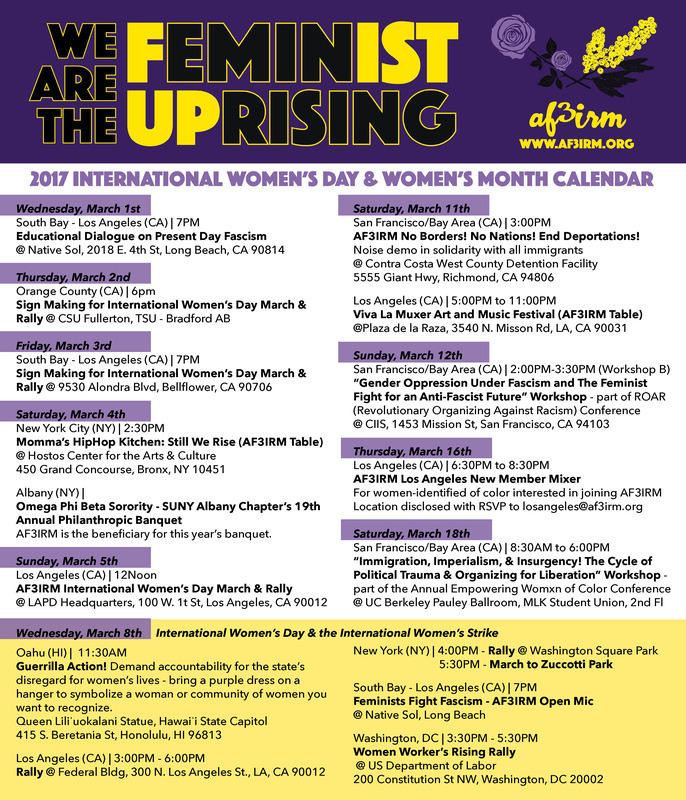 Women Worker’s Rising Rally – join the AF3IRM DMV contingent! AF3IRM No Borders! No Nations! End Deportations!